While doing my daily Blog Hops. I have came across this style of card several times. So here is my go at this Tri Fold Shutter Card. What is really neat about this card is it fold up and fit in a standard card size envelope. I found the pattern on SCS. You need a 12 x 12 piece of card stock. The embellishment were the most time consuming, There is just so much you can do. Made a pocket card with Ups! new IN COLOR Razzleberry. I think this is my favorite new color. I already have bought more paper because I keep reaching for this color card stock. 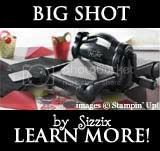 I ran my card stock through my Big Shot with the Elegant Bouquet textured impressions embossing folder. I also used Cottage WallDesigner Series Paper (DSP) for the belly band. Stamp set used once again is Sweet Wedding. Ink used is Rich Razzelberry. Thanks for looking!!! Happy Stamping!!! I had fun today making this cute little bag. So easy to make with Big Shot Die-Cut Machine #113439. I used the big die called Bag with Scallops #114519. 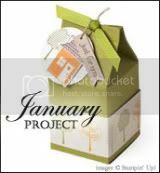 The bag it self is made with Old Olive card-stock and Designer Series paper called Cottage Wall # 115671. Stamp set used is a new Stamp set called Wings of Friendship. A couple of post ago June 11th. I did a project that I called Note Station. It had some bright color thumb tacks that I found at Target. Well I took a pair of pliers and nipped the tack part off and used it for a button type closures. 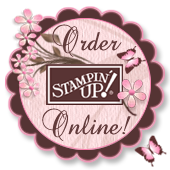 I wanted to share all the colors they come in so you could see how well they match Stampin' Ups! card stock. No tacks will be wasted. There is an other great reason to run down to your local Target is the price $1.50 for 60. Wow! So what do you think about this great deal ? So fun!!! This adorable stamp set makes great Children Cards. I used Designer Series paper called Tall Tales #115679 $9.95. Stamp Set is called Animal Stories #116716. The card-stock I used is So Saffron, Brilliant Blue and Old Olive. Five different punches used 1 3/4 ", 1 3/8", 1 1/4",3/4" circle punches and Scallop Edge punch. Ribbon is Apricot Appeal grosgrain. Flower Assortment Designer Brad #112583 used for the center of Happy Birthday tag. Sentiment stamp set is called Thinking Happy Thoughts #1150092 Sorry about the photo today. I looks like my circle punches were put on off center but it was just the angle took the picture. Have a wonderful Wednesday. Here is my last Medallion share for at least the next few days. I used Stampin' Ups! new In Colors. I used Bermuda Bay and Whisper White card stock. I stamped the image at 2 corners with Bermuda Bay ink and then cut the center out of completely seperate image. I also wanted to used my new Embosslit exclusive Stampin' Ups! Thanks # 115957. Then of course used 1/2" Polka-Dot Grosgrain ribbon # 115613. Well, I hope everyone had a great weekend.I certainly did. Had the kids and Grandson for the weekend. We were very busy. I wanted to post these sooner but here it is now. I used Razzleberry card stock and cardstock vellum. Stamped the Razzleberry ink on the vellum and let dry overnight. Then took my stylist and mat pack pad and rub over some of the white parts of the stamped image. I like the results of this technique. It made the areas I rubbed turn white. thanks for taking your time to look. Here is an other card made with Stampin' Ups! Medallion big stamp #115225. I decided to make serveral cards with one stamp set at a time. It is hard not to play with the others too. But I wanted to show how many different card you could make with one stamp. On this card I used Rich Razzleberry, Whisper White, and Bermuda Bay ink and card-stock. New Polka-Dot ribbon in Rich Razzleberry. Designer Hardware Jumbo Grommet Whisper White. New punch called Modern Label. Magnetic Movers and Shapers die Modern Label. Also Word window punch. Thanks for looking today. Have a great weekend. More to come on Monday. I told you I really liked this set. Medallion big stamp is so beautiful with any color. For this card I used the new "In Color" "Bermuda Bay". I had some time to play with my new goodies from the new Stampin' Ups! 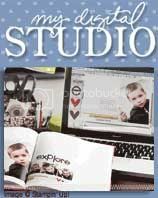 2009-2010 idea book and catalog.I am so in love with this new big stamp called Medallion. I stamped with Versa mark on new card stock color Soft Suede. Then embossed with very vanilla embossing powder. The other stamp set I used for the sentiment is new also. It is a Hostess set called "Wings of Friendship". I hope you like it. Thanks for looking today.